This week is Diwali, also known as Deepavali. 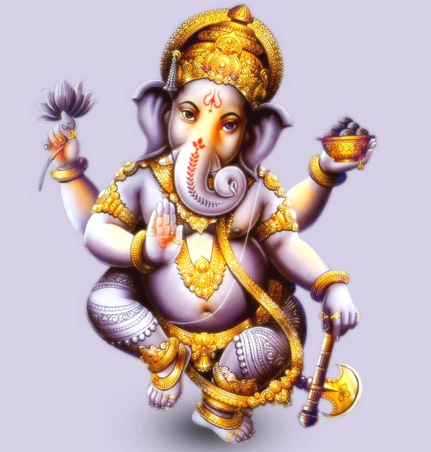 It is the Hindu New Year and begins two days before the new moon, sometime between October 14 and November 13. 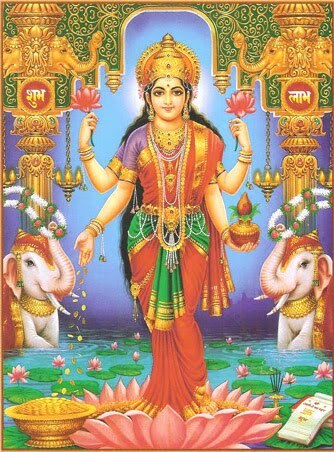 Today is Dhanteras, two days before the New Moon. Today homes and businesses are cleaned and renovated. Doors are adorned with torans, entryways are decorated with rangoli and it is a lucky day to purchase dhan - gold, jewelry and new kitchen utensils. Lakshmi is beautiful. Notice the elephants in the background. Tuesday will be Choti Diwali. The home is cleaned thoroughly and the broom placed near the alter. Lakshmi visits the cleanest homes first (she wouldn't be visiting mine, that's for sure!). Her small footprints are patterned onto the floor with a mix of rice flower and vermillion powder, or rice paper and a red pen can mark footprints to be taped onto the floor. Bathe in fragrent oils and purchase new clothes. Food for the alter include sweets made from coconut, almonds, pistachios, nutmeg, ginger, sesame and poppy seeds. I'll revisit Diwali on Wednesday, my favorite of the five days, but here are some pictures of Ganesh and Lakshmi for you to enjoy. Happy Diwali to my friends in India. Current Location: Looking forward to a good week. Time to get the Indian sweets in. Thank you for sharing - the art is beautiful, and I especially enjoyed hearing about the meaning behind the days.